The top 10 most valuable beta contributors will be given a Special Present. And their names will be printed in the StartMenu Final version. FREE and award- winning customer support for all users. Provide Multiple options for "Power button settings"
Last edited by HongMay; 01-19-2017 at 12:06 AM. Reason: new start menu 8 just released! threeone, is this the same app, or a different one? I don't want to get the wrong one, & this one looks a lot different from the one here. Thanks for attention. No, they are different apps. 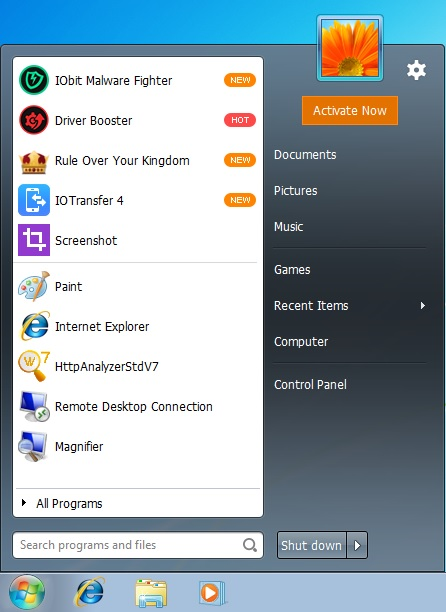 This StartMenu8 is developed by IObit, a top software vender. StartMenu8 Beta available soon. I will post once download available. Thanks for making this clear, threeone. I'll wait for the one pictured above. IObit is a top software vendor, they also have some security apps. The other wasn't really that much different from Start Menu 7, the first one that I tried. It didn't stay on my OS for long. startmenuX and startbuttonX are similar, I have them and love them. Thanks for your program, I hope that it will be even better (the one pictured above is missing) and I was wondering whether it will ever be free or will be paid version? So far, so good! Seems that I'm on Windows 7, this is an good alternative for those wanting a Start Menu. Now we have another option. Will continue to use it to view it's progress. I also realize this is still in Beta, Sleep puts the PC in a deeper one than the same in 7 does. More like Hibernation, but that's OK. My wife & I share the same mouse pad, for another week or so. Every time she uses her notebook, she manages to wake up my PC by bumping my mouse, or moving it out of her way. This type of sleep prevents this. A decent app for an unfinished one. Hopefully MS won't sue for copyright infringement. also startbuttoX and startmenuX, more or less the same result, happily working since shortly after win8 DP was released on my system. edited out Russian Language version. Last edited by Medico; 10-07-2012 at 03:54 AM. Thanks, i use it, and I advice to other !